The very best thing about staying the night in a hotel on the last day of your vacation, in case I haven’t said it enough, is getting a good night’s sleep on a real bed, then a hot shower, and finally not having to clean up the mess you make. Not that we make a huge mess, it’s just that I get a real bang out of not having to clean up the bathroom. I’m easily amused. One of the worst things, and sometimes the very worst thing about staying in a hotel is the complimentary breakfast in the morning. I’m grateful that most hotels offer one, because it means there will at least be coffee, but at a lot of the hotels I’ve been to they barely make a token effort, and at a few the effort has been not just wasted but actually seems to have been counterproductive. One place we stayed at had nothing but multicolored kids’ breakfast cereal, spotted bananas, and a tray of soggy doughnuts. But most of them at least have a waffle iron, which I’ll always line up for because it makes probably the safest food in the place, and also because waffles. Who doesn’t like waffles? Stupid people who don’t know how to properly butter them, then drench them in way too much syrup. I like banana slices on top of mine so I can pretend I’m eating something that’s good for me, but I’m okay without the banana, just so long as I have enough syrup. And by “enough,” I mean the whole damn pitcher of syrup. Don’t even ask if I’m done with it. That’s the one thing majorly wrong with the waffles that come with the complimentary breakfast at hotels: those teeny-tiny little plastic cups that the syrup comes in. I have to open at least five or six just to get a corner of the waffle damp enough so I can start eating. Our cab ride to the airport was positively batshit crazy. It wasn’t supposed to be a cab ride, for a start. The hotel advertised that they had an airport shuttle that would pick us up at the front door and deliver us to our airline check-in desk. There was even one of those double-wide shuttle buses parked right outside the window of our room, so naturally we assumed that’s what would meet us at the curb after checkout shortly after eleven o’clock. While we were waiting at the curb, though, an all-black minivan, with the oddly incongruous name of the Yellow Cab company painted across the door, pulled up to the curb, and out of the driver-side door popped its Asian-American driver. Remember Egg Shen, the wizard slash bus driver in the movie Big Trouble In Little China? This cab driver was Egg Shen’s spitting image. “You going to the airport?” he asked us. “Well, yeah, but we’re waiting for the hotel shuttle,” we answered. “Is this the airport shuttle?” My Darling B asked him. “To the airport, right,” he confirmed. There was no charge. It really was the airport shuttle. Egg was a contract driver who came with his own transportation. The shuttle bus parked out front of the hotel was apparently just for show. Egg loaded our bags into the back of his van and, after we climbed into the passenger seats, he took off down the road like he was driving the getaway car for a bank heist. Then, while he was evasively weaving through traffic at high speed, his cell phone rang. He casually flipped it out and started jabbering into the bluetooth earpiece sticking out of his right ear while almost, but not quite managing to keep the van between the white lines of whatever traffic lane he may have believed he was driving in. When he was done with that call, he picked up his cell phone and made another call, and then another, talking with who I can only presume was his dispatcher. He kept up a constant patter with his caller as we approached the airport and hardly missed a beat as he made a dramatic entrance by swerving at the very last moment through a gap between a couple of concrete Jersey barriers. I was sure he’d gone too far, maybe even gone past it and would have to find another gap, but he was just as sure – well, turned out to be a bit more sure than sure that he was going through it. I clenched my teeth for the impact that never came. When I opened my eyes, we were parked curbside and Egg was getting out to unload our bags. I should note that we were smugly self-satisfied all morning about the fact that we were able to pack all the crap we’d collected during the past fortnight into our luggage. That sweet smugness quickly evaporated when we tried to check our bags at the airline counter and were told by Edward, our very helpful agent, that our check-bag was twenty-five pounds overweight. We could pay the overweight charge and check it as is, or we could slip out of line to redistribute our belongings among our carry-on bags if we liked. “How much is the overweight charge?” My Darling B asked, just out of curiosity, I guess, because I knew she had no intention of paying it. “One-hundred dollars,” Edward informed us brightly with his best, most professional smile. So we stepped out of line, dragging our overweight bag to the empty end of the airline counter, cracked it open and laid it, open-faced, on the floor, then stepped back and rubbed our chins in deep thought. Kidding. We pretty much gutted it without thinking much, gouging great big wads of dirty clothing out, collecting all the printed matter in a heap, then divvying up the souvenirs. If you’re thinking that “souvenirs” might be a euphemism for “beer,” you know us too well. The biggest troublemakers were three full twenty-two ounce bottles of high-gravity beer, or “bombers” (thank goodness I didn’t slip and call them that in the airport), and an empty sixty-four ounce flip-top growler. Once they were safely parked, we stuffed the wads of clothing back in basically as padding. Because we were at an unused station at the airline check-in counter, I laid the suitcase on the scale as we stuffed everything back in, keeping one eye on the readout to make sure we didn’t go over the magical hundred-dollar limit. When we were within a pound or two, we would try to latch the bag shut, fail and have to re-shuffle the contents a bit, try to latch it again, fail, re-shuffle, and repeat until those latches finally clicked shut. Then we had to find a place in our carry-on luggage for all the stuff that was left over. It was pretty simple, really: What we absolutely had to take back went in the bags, and anything else made a one-way trip to the garbage can. Done. After checking our bag and shuffling through security in our stocking feet, we hiked to our terminal, found our gate and let out a deep, exhausted sigh, wondering what to do with the next couple hours we had before our plane boarded. 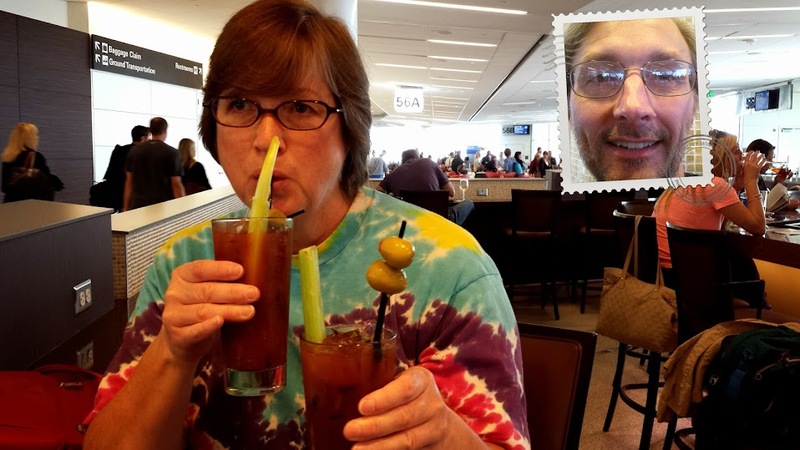 Lucky for us there was a bar next to our gate where we could not only soak up a couple Bloody Marys, the drink that has become traditional at the beginning and end of each of our trips to the farthest reaches of these United States, but there were also electric outlets close by so we could plug in our phones and live-blog our little party to all our Facebook friends. The last glitch in our trip home was that we weren’t seated together on the plane and no amount of sweet-talking from My Darling B could get the good employees of American Airlines to rearrange the seating assignments. I sat directly behind B, so I entertained her and my fellow passengers during the four-hour flight home by doing things like sticking caterpillars down the back of her dress and dipping her pigtails in the inkwell.